This figure is a visual representation of the 5Ps – Problems, Plan, Process, Programs, and Product. 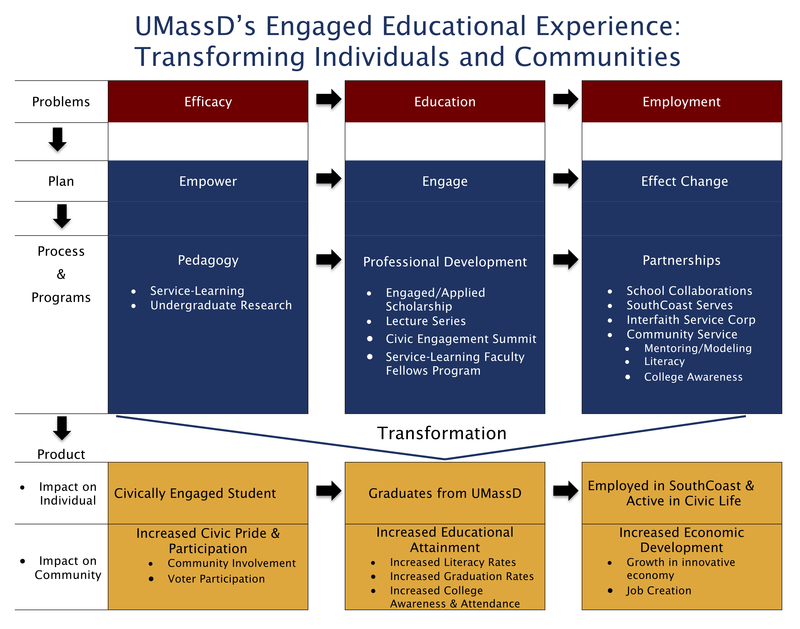 It serves as a map of the Leduc Center's strategic plan - showing key linkages between individual student impact (empowering them to engage in activities that effect change) and macro-level impacts on key problems currently facing our community (efficacy, education, and employment). Founded in 2008, the Robert and Jeanne Leduc Center for Civic Engagement is tasked by UMass Dartmouth with the mission of integrating intellectual talents and pursuits with the needs of the community. To enrich the lives of our faculty, students, staff, and community through engaged learning, active citizenship, meaningful community service, scholarship, and mutually-beneficial partnerships. By the year 2025, the Leduc Center, in conjunction with our internal and external partners, will have positively impacted the regional challenges of low educational attainment and economic development by empowering, engaging, and effecting change individually and collectively. In the short term, we will impact early literacy and college awareness rates. To enhance student learning through civic engagement, meaningful community service, and service-learning. To foster engaged scholarship with students, faculty, and the community. To develop and sustain partnerships and programs to positively impact community life, early literacy rates, and college awareness. To secure funding to support our mission. Our plan is intentional and focused on empowering students to create change within themselves and our community (locally and globally). The empowering mechanism is the civically-engaged education experience which exposes students to real-life challenges that reside in our local, global, and research communities. These experiences, coupled with reflection, serve as the catalyst to transformative change. Our short-term goals focus on community building, early literacy, and college awareness as a means to educational attainment and economic development. Strong partnerships dedicated to collective impact are essential to our work.